All-wheel drive and the luxury to go with it. The Genesis G80 is a midsize luxury sedan, designed to take on such models as the Audi A6, BMW 5 Series, Cadillac CTS, Mercedes-Benz E-Class, and the Lexus GS. 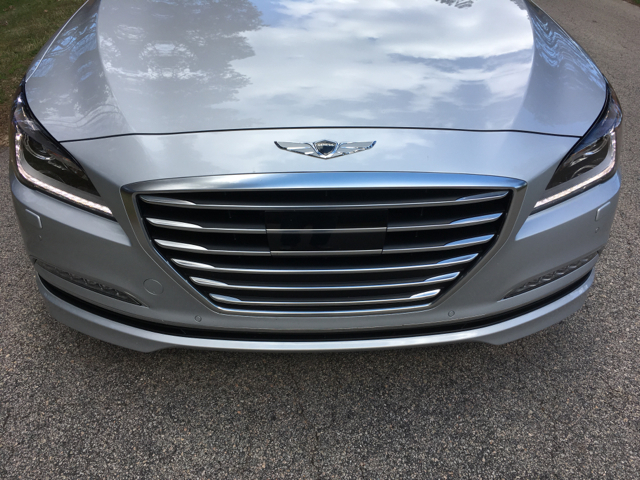 Up until last year, we knew this vehicle as the Hyundai Genesis, but as of 2017, Genesis is now its own brand. 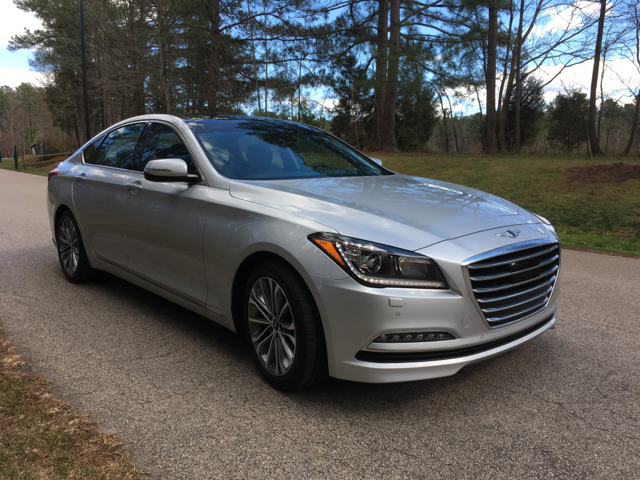 Thus, last year’s Hyundai Genesis is now this year’s Genesis G80, while the Hyundai Equus was replaced by an all-new G90 model. Consider the G80 as a refresh of the previous Genesis sedan model, adding more standard equipment as befits a luxury marque. The 2017 Genesis G80 is offered in seven model or package choices: Standard 3.8 RWD ($41,400), Standard 3.8 AWD ($43,900), 3.8 Premium Package RWD ($46,150), 3.8 Premium Package AWD ($48,650), 3.8 Ultimate Package RWD ($50,350), 3.8 Ultimate Package AWD ($52,850), and a 5.0 Ultimate Package AWD ($54,550). Add $950 for destination. My initial Genesis G80 visitor arrived in November, a V8-powered rear-wheel drive model. Three months later a G80 AWD model showed up, powered by a 3.8-liter V6 engine. For now, all-wheel drive is available only with the V6, but a V8 AWD option is in the works. The G80 wades into the luxury arena much in the same way a swimmer enters the water surrounded by sharks. Its starting price undercuts the competition by $5,000 to $11,000 or more, but the lower price point isn’t the only factor Genesis uses to win new customers. Indeed, the Genesis brand carries over the lengthy 10-year, 100,000-mile powertrain warranty offered by Hyundai and builds on that with valet service, roadside assistance, and free maintenance — each service for three years or 36,000 miles, whichever comes first. Complimentary connected car services and satellite TravelLink is included in that critical timeframe too — typically matching the lease term for these models. Notably, each warranty and service feature is something luxury shoppers want (and expect) when investing in a particular brand — here, Genesis not only shows up, but it shows off. 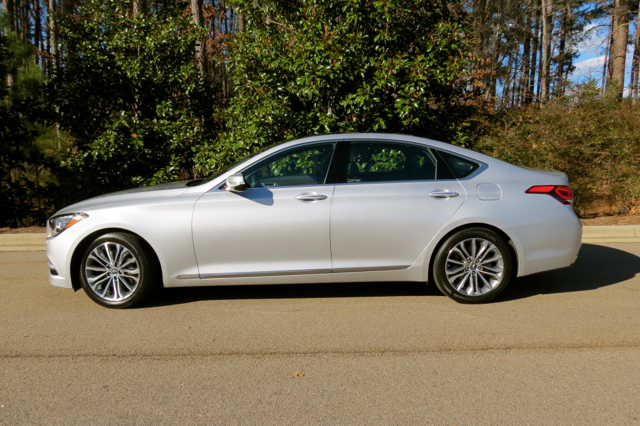 Besides my two recent G80 visitors, I had a pair of Genesis sedan models prior to the brand transformation. The G80 is nearly identical to the previous Genesis, but with no signs of “H” or Hyundai badging. The winged Genesis logo is in place, underscoring what the new brand is all about. What is familiar about the G80 is everything else from its long, elegant visage to its hexagonal grille with six horizontal bars. Wrap-around headlamps, LED accent lights, and LED fog lamps complete this sedan’s frontal presentation. From the sides, Genesis opted for a more conservative approach, eschewing the dramatic lines and body sculpting found in such Hyundai models as the Sonata. That said, a distinctive character line at the door handle level adds interest along with rocker panel trim, and creased wheel wells. 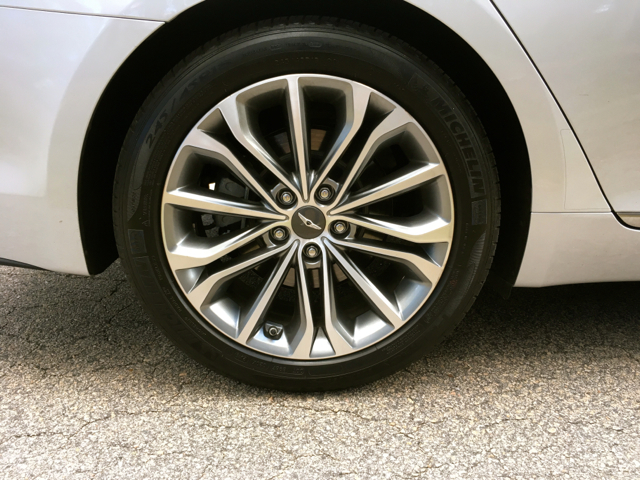 Furthermore, standard 18-inch alloy wheels add flair and distinction to this midsize luxury sedan. From the rear, you’ll find a trunk lip spoiler. Large wraparound combination lights, reflectors and dual exhaust ports are also present. I enjoy luxury cars in this class for a number of reasons. That they actually seat five people without compromise is one of those reasons. 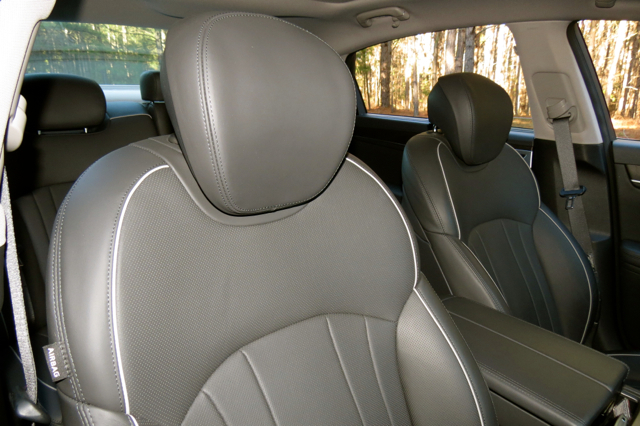 Sporty, firm bucket seats are up front, offering generous shoulder and hip bolstering. 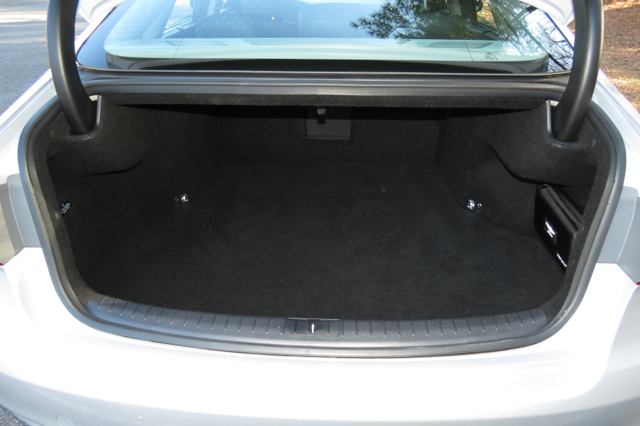 The split 60-40 fold-down rear bench seat includes a fold-0down center compartment with storage and two cup holders. As much as I like the third seat placement option, folding the middle position provides near limo-like comfort. All G80 models are dressed in full grain leather with contrast stitching. 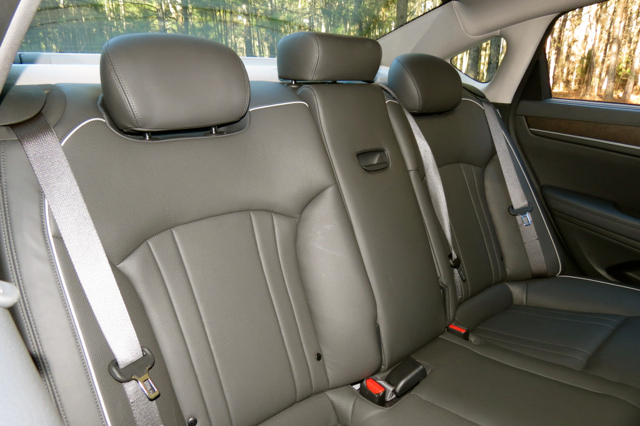 Seat surfaces are smooth, comfortable, and easy on the body. Available genuine wood trim dresses the lower dashboard and can be found on various inlays in the cabin. Chrome trim and soft-touch materials are also present. 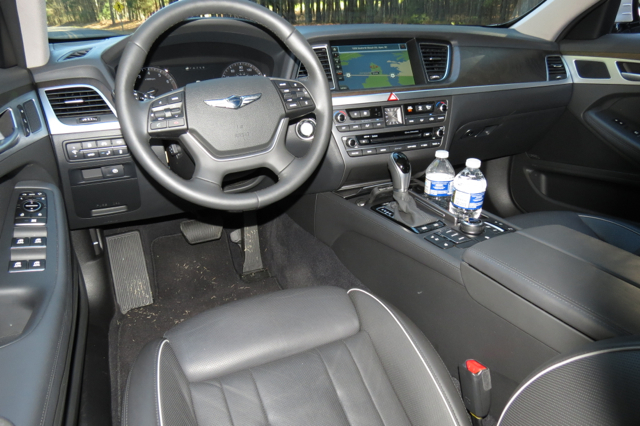 The G80 features a long list of standard equipment, including 12-way power-operated front seats, heated front seats, a leather-wrapped heated steering wheel with a tilt and telescopic function, an 8-inch touchscreen center display, full power accessories, Android Auto and Apple CarPlay, satellite radio, and a hands-free trunk. Choose the premium package ($4,750) and you’ll also get a power tilt and slide panoramic sunroof, a rearview camera with parking guidelines, wood and aluminum trim upgrades, a 14-speaker Lexicon audio system, power rear sunshade, and manual side window sunshades. You can also choose the ultimate package ($4,200), what brings in upgraded leather, head-up display, a 9.2-inch color display with navigation, and a 17-speaker Lexicon audio system. All told, my test model retailed for $53,800, plus destination. All G80 models are equipped with nine airbags, including a driver knee airbag. The usual anti-lock brakes, and stability and traction control, are also present. You also get automatic emergency braking, what works in tandem with smart cruise control and lane keep assist for stop pig this sedan if you don’t apply the brakes on time. One of my favorite tests of this feature takes place on high-speed roads with the occasional traffic light. As the sedan approaches the intersection with traffic stopped, it begins to slow down and come to a full stop. Not once did I have my foot away from the vicinity of the brake pedal, however. Just in case…. All models also come with blind spot detection and rear cross-traffic alert, and lane departure warning. 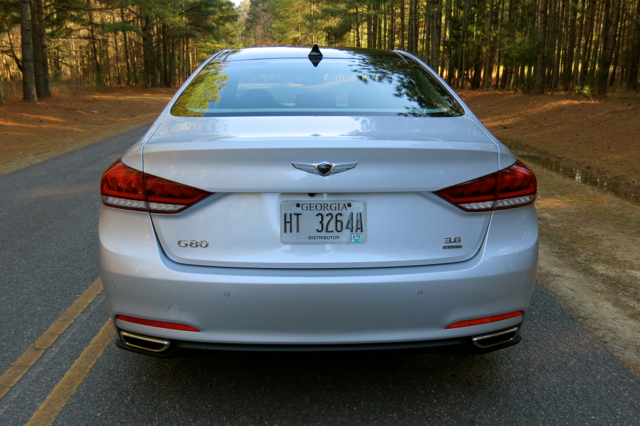 The Insurance Institute for Highway Safety (IIHS) has awarded the 2017 G80 with its Top Safety Pick+ award, its highest honor. Similarly, the National Highway Traffic Safety Administration (NHTSA) has bestowed its top five-star crash test rating on the Genesis. 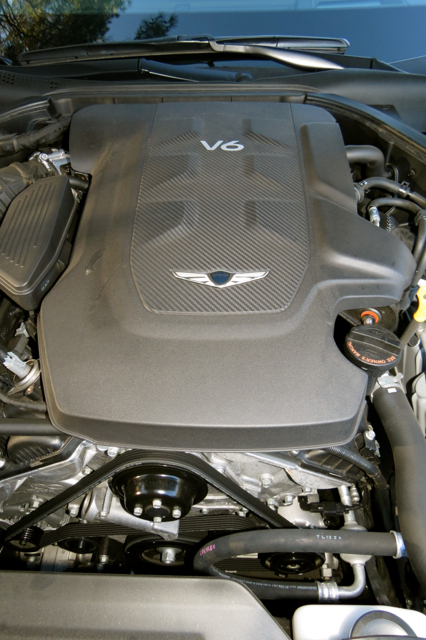 The G80 line and the Genesis sedan before it has always been marked by two engine choices: a 3.8-liter V6 with 311 horsepower and 293 pound-feet of torque or a 5.0-liter V8 engine with 420 horsepower and 383 pound-feet of torque. 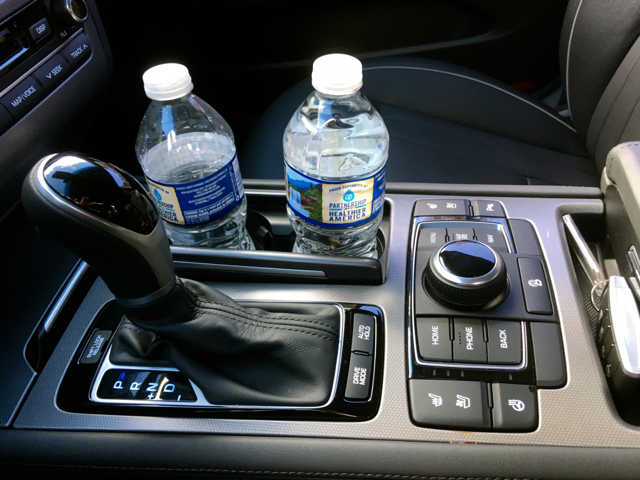 Both engines are paired with an eight-speed automatic transmission with manual shift mode and paddle shifters. All-wheel drive certainly does make a difference for the G80 in the usual areas — twisty roads and wet surfaces. A dry week made it impossible for me to accurately gauge the sedan’s responsiveness, but it is safe to say that torque distribution is realized when conditions warrant. Although performance is sufficient with the G80’s V6, I must admit wanting that extra bit of power a V8 supplies. But that means trading off available all-wheel drive for rear-wheel drive only. Beginning in 2018, optional all-wheel drive rolls out across the product line. Also coming in 2018 is a third engine choice: a 3.3-liter, twin-turbo V6 engine with 365 horsepower and 376 pound-feet of torque. Available with the all-new G80 Sport trim, the new powertrain offers a tantalizing middle ground, while also giving Genesis a performance line it needs. I’m not about to say it’ll take it to the BMW M Line, Cadillac’s V-Series, or other performance lines offered by the luxury brands, but it is a step in the right direction. The new-for-2017 Genesis brand certainly has its work cut out for it. With two models to start, more product choices are needed. Next up is a compact G70 sedan, followed over the next few years by three more model lines. Clearly, Genesis intends to expand its footprint to offer a fully competitive line of vehicles. Genesis will have to sell the brand to traditional luxury buyers and that’s never an easy thing. One reason why the brand was created was to offer separation between Hyundai and Genesis, much in the same way you have Toyota/Lexus, Nissan/Infiniti, and Honda/Acura. But those brands have years of experience behind them in a market where consumers are unkind to anything less than the best. 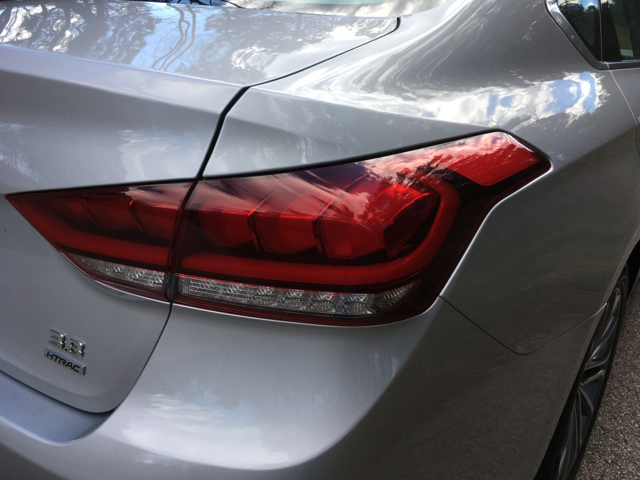 As for the G80, it provides an affordable gateway to the Genesis brand, a well-equipped model with all the trappings you would expect from a midsize, luxury sedan.